Background: The pattern of Mycobacterium tuberculosis susceptibility to first line drugs and multidrug resistance in Al-Madinah Al-Munawarah, a seasonally overcrowded are during Hajj and Omrah, is not well studied. Objective: This study aimed to investigate anti-tuberculosis drug resistance and its distribution among new cases in Al-Madinah Al-Monawarah. 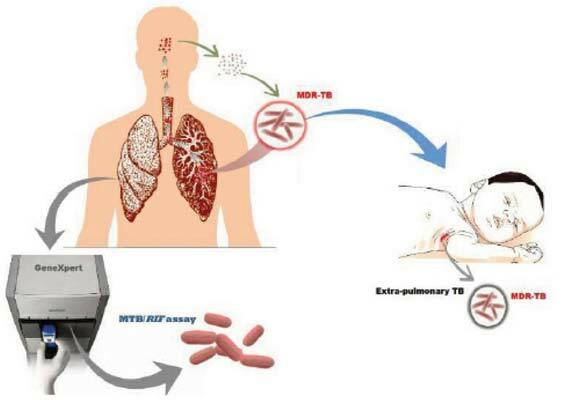 Methods: Study subjects included 622 patients with first time confirmed TB referred to the central tuberculosis laboratory in Al-Madinah between January 2012 and December 2014. Results: Out of the 622 isolates, 99 (15.9%) were Mycobacteria Other Than Tuberculosis (MOTTS) and 25 (4.0%), three of which (12%) were children under five years of age, revealed multidrug resistance (MDR). Monoresistance to isoniazid (H) was (1.8%), to rifampin (R) was (1.4%), to streptomycin (S) was (1.9 %) to ethambutol (E) was (1.1 %) and to pyrazinamide (Z) was (2.1%). Conclusion: Being among the new cases, multidrug resistant tuberculosis (MDR TB) is supposed to be caused by strains which are originally multidrug resistant. Neither nationality nor gender was found to be associated with MDR TB. Since 12% of MDR cases were among children, a probability of primary infection with MDR strains is to be considered. Moreover, mass gathering during Hajj and Omrah seasons does not seem to increase the burden of MDR in the region. However, further investigation is needed to molecularly characterize MDR isolates and their phylogenetics and geographical origin. Keywords: MDR TB, Al-madinah Almonawarah, Genexpert, BACTEC MGIT 960, mycobacterium, antituberculosis drug, phylogenetics. Keywords:MDR TB, Al-madinah Almonawarah, Genexpert, BACTEC MGIT 960, mycobacterium, antituberculosis drug, phylogenetics. Abstract:Background: The pattern of Mycobacterium tuberculosis susceptibility to first line drugs and multidrug resistance in Al-Madinah Al-Munawarah, a seasonally overcrowded are during Hajj and Omrah, is not well studied.